The Zeiss LSM 880 with Airyscan is a confocal point-scanning microscope able to generate high-resolution three-dimensional images of thick specimens with high sensitivity and low photodamage. It is an inverted microscope especially suitable for live cell imaging and photobleaching experiments, equipped with a large size incubator for temperature control and CO2 supply and with Definite Focus for hardware focus control during long time-lapse acquisitions. 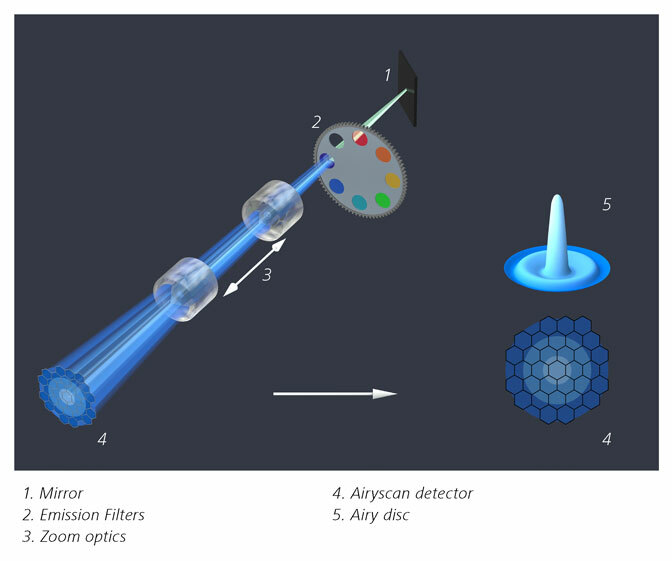 Its Airyscan 32 channel area detector is able to collect all light from an Airy pattern simultaneously, allowing for increased resolution (140 nm laterally and 400 nm axially, at 488 nm). Its scanning unit further includes two PMT detectors (one of them cooled) as well as a GaAsP detector for increased sensitivity (45% QE compared to ~25% QE for conventional PMT). It is equipped with lasers from violet to far red (405, 458, 488, 514, 561, 594 and 633 nm excitation wavelengths). With this system you can perform optical sectioning of fluorescent samples which are too thick for a widefield system such as the Zeiss Cell Observer or the Zeiss Axiovert 200M. Image resolution with Airyscan is higher than the Zeiss LSM 710 and detection sensitivity is also higher than faster confocal systems such as the spinning disks 3i Marianas SDC and Zeiss Cell Observer SD. If your personal computer cannot handle all the data you collected, check out the Big Guy or Colossus. Data files older than 1 month will be automatically deleted on this system, please copy your data to the iMM server using the desktop link. Exceptions to these rules require approval from José Rino. Close the software, leave the lasers on and log off the computer. Clean up any objective where you used immersion oil. Make sure that there really is another user going to use the microscope. Clean up any objective were you used immersion oil. Exit the software, shut down the computer. Turn off the MAIN SWITCH.